6 Grotes Buildings is an impressive looking Georgian house, it is part of an even more impressive terrace tucked away in the corner of the Heath close to the ‘village’. In the 1930s it was home to one of the most important social research ‘movements’ of the era – Mass Observation. Before looking at Mass Observation, it is worth covering a little about the terrace. It was developed by Andrew Grote in the 1760s on land leased by Morden College to fund a chaplain (1). Grote was a speculative developer and banker, who had made his wealth as a ‘merchant’ trading with enslaved estates in Maryland, no doubt he traded elsewhere too. 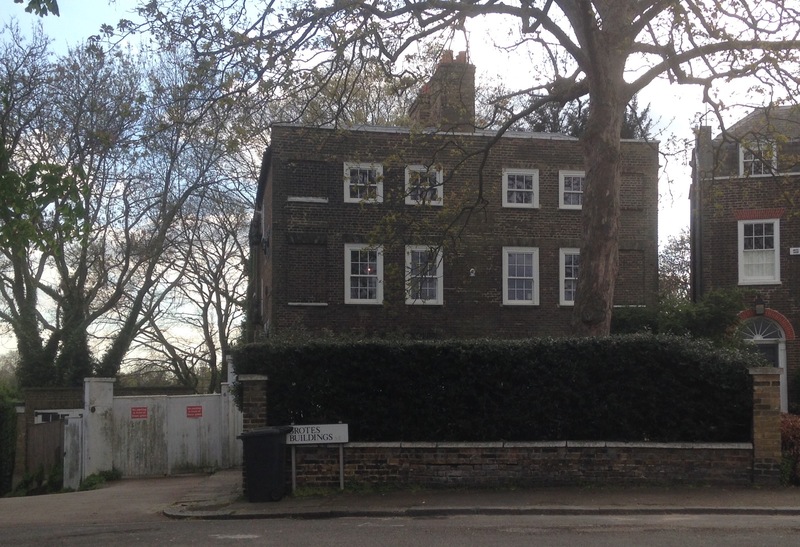 Grote lived on the opposite corner of the Heath at Point House. There were two main strands to Mass Observation, one of which was based at Grotes Buildings. This was led by Humphrey Jennings, a film maker, and his friend Charles Madge, a poet and journalist, who was later to become a professor of sociology. They recruited hundreds of volunteers to write accounts of their daily experiences. The first time this happened was on 12 May 1937, the day of George VI’s Coronation. Participants told their own stories of what they had done from waking up to going to sleep, the resulting diaries provided a wonderful glimpse into the everyday lives of people across Britain, and the narratives have been used as a resource for those researching aspects of the era. Later similar work included amassing a collection of diaries by over 500 home front civilians. Nonetheless, many experiences were recorded often as anthropological type readings of ‘rituals’ of round-buying along with consumption rates, the presence and absence (mostly the latter) of women and what was discussed. Some of his was published in John Sommerfield’s 1943 book, ‘The Pub and The People’ and the more recent ‘Worktown’, written by David Hall, and published in 2015. 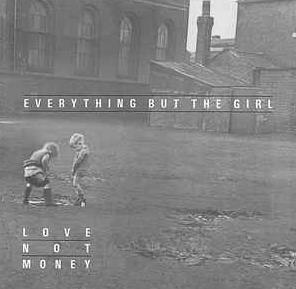 Some of the photographs became widely used, such as the one by Humphrey Spender which was used as an album cover by Everything But The Girl, for their 1985 release, Love not Money. Artists too worked on the project including, William Coldstream, who had also worked with the East London Group of artists, and Humphrey Jennings. 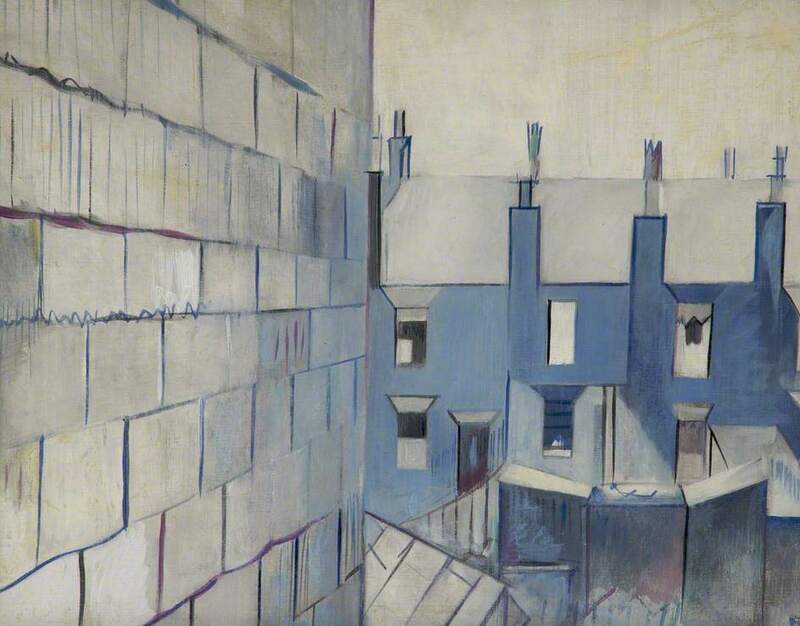 Jennings painted several scenes of life in Bolton, including this one of terraces, which, like many of the images collected, is held by Bolton Museum and Art Gallery. Jennings was much better known as a film maker and was later to work with the GPO Film Unit, which was based in Bennett Park in Blackheath, and was covered in Running Past a couple of years ago. Mass Observation effectively finished by the end of World War 2, but was relaunched in the early 1980s at the University of Sussex, where he archives had been relocated in the previous decade. Initially, there were requests for feedback on specific areas, the one in the autumn of 1981 asked for views on shopping, the SDP-Liberal Alliance, unemployment amongst other things. 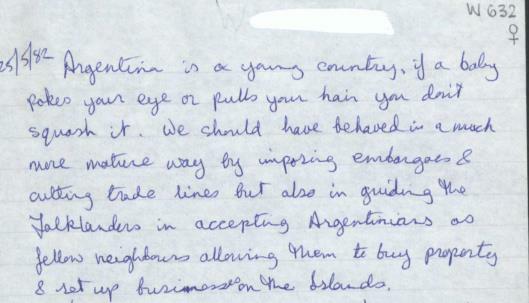 The following year participants were asked to focus on the Falklands War – part of one randomly chosen post is below (on a On a Creative Commons, via the University of Sussex) – there are lots more which make for fascinating reading. May 12 2017 will make the 80th anniversary of the recordings of experiences of the Coronation of George VI, and as has happened for several years, Mass Observation have replicated their annual call for day diaries, capturing the everyday lives of people across the UK. The written diaries will be used by a wide range of people for research, teaching and learning. Do participate! There are details of what to do on this link. The painting is owned by Bolton Museum and Art Gallery, but has been made available on line through the wonderful on-line public art gallery – Art UK, and can be used for non-commercial research such as this. This entry was posted in Blackheath History and tagged Blackheath, Grotes Buildings, Humphrey Jennings, Mass Observation, Worktown on May 11, 2017 by Paul B.